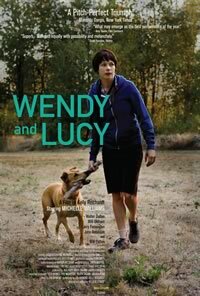 After generating a lot of buzz as an official selection of the 2008 Toronto International Film Festival®, Kelly Reichardt’s Wendy and Lucy is a modest yet deeply affecting road movie about an idealistic young drifter and her faithful canine companion who live on the fringes of society. The film stars Academy Award®-nominee Michelle Williams (Brokeback Mountain, I’m Not There) as Wendy Carroll, an Indiana native who – along with her dog Lucy – has set out for Alaska where she hopes to find gainful employment in a fish cannery. As she travels, Wendy and Lucy offers a delicate and understated portrait of regional American life.